I've mentioned here a couple of times over the years that when I was in high school I had a small part in a play with Julie Adams. 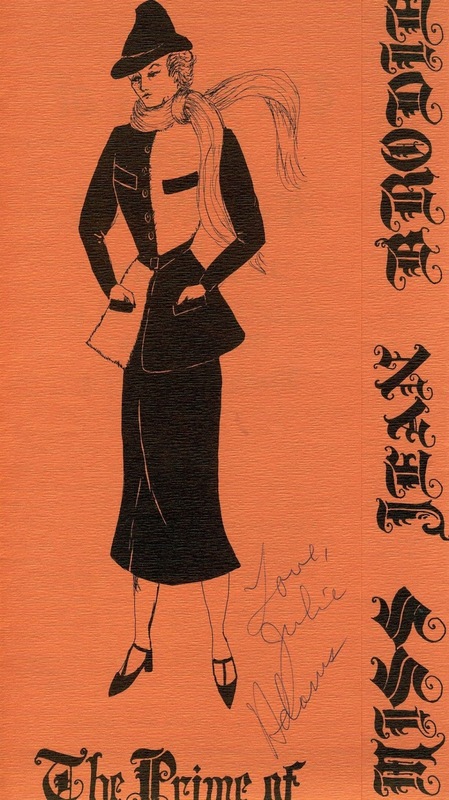 The play was THE PRIME OF MISS JEAN BRODIE, and it was performed at a local junior college. I was one of the schoolgirls in some of the earliest scenes of the play; you might say I was a "background extra," as I think my only lines were things like "Good morning," said with all the other schoolgirls. Miss Adams is probably best known for appearing in a string of Universal films of the '50s, including numerous Westerns and THE CREATURE FROM THE BLACK LAGOON (1954). Being on the same stage with Miss Adams was a particular thrill for me, as she had appeared in a couple episodes of my favorite TV series, MAVERICK, which I'd discovered in TV reruns. I'd come home from school every day anxious to see another episode! Julie Adams was working as recently as a 2008 episode of LOST. She'll be 85 this fall and is a lovely woman. There's a terrific multi-part interview with her available on YouTube, conducted by Alan Rode at the Egyptian Theatre in 2009. Reviews of Julie Adams films previously posted here: BEND OF THE RIVER (1952), HORIZONS WEST (1952), THE LAWLESS BREED (1953), and THE MAN FROM THE ALAMO (1953). October 27, 2011 Update: Tonight's Movie: Creature From the Black Lagoon (1954) at the Egyptian Theatre -- a chance to meet Miss Adams again in person! 2015 Update: I was delighted to have the chance to say hello to Julie at the Palm Springs Classic Science Fiction Film Festival. 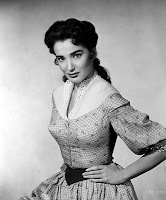 February 2019 Update: Farewell to Julie Adams. The program is a lovely souvenir. Julie is a popular gal around here. My husband will even deign to watch "Murder, She Wrote" if he's promised an appearance by Eve Simpson. I guess I should have watched "Lost". My most recent Julie sighting was an episode of "Family Law". 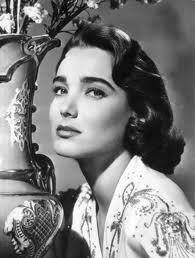 Love your thoughts on Julie Adams! I really need to catch up on MURDER, SHE WROTE via Netflix. It was originally on when I was knee-deep in babies, toddlers, and/or preschoolers (grin) and did virtually no TV viewing. :) So many fun actors appeared on that show! Your mention of Maverick tells me (more or less) when you were in high school; I was getting my master's at Long Beach State about the same time. Maverick is likewise my favorite TV series and I too hurried home from school every day to catch those reruns. (What channel was it? KTLA-5 sticks in my mind for some reason.) A Maverick complete series DVD set is long overdue. At least I got the collector's VHS series (44 episodes) about 20 years ago, which I eventually transferred to DVDs before I wore them out. What a fun note, Jim! You obtained your Master's from my husband's alma mater. 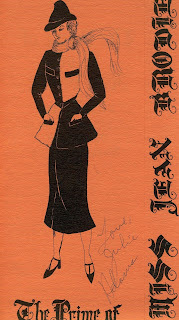 :) That's quite a coincidence you appeared in a production of MISS JEAN BRODIE in the same general time frame. MAVERICK was shown on what was then KHJ Ch. 9; it was later renamed KCAL. The Warner Bros. company can't quite seem to make up its mind whether to give MAVERICK a regular retail release or a Warner Archive release, which could be part of the reason for the delay. That's purely speculation on my part, but over the last couple years I've read comments from Warner execs indicating the show was coming, yet it's still not appeared, while shows which were somewhat less popular have been released. My dad collected the Columbia House VHS set and kindly lets me "store" them for him! I've really enjoyed sharing the show with my kids. While you're waiting for the series to make it to DVD, keep your eyes open for a new biography of MAVERICK star Jack Kelly by Linda Alexander, coming from Bear Manor Media in late 2011. Laura, thanks for sharing your personal experience with Julie Adams. I have been a fan for years. Nice to know she was lovely in "real life", too! OMG - hello from one of your fellow cast members, I was just noticing that Julie Adams did the voiceover for the secretary on the telephone in the recent Jodie Foster movie Carnage, I was reminding my husband about my "role" as one of Julie's students in this very same production, as I do every time we see her on an old rerun of Star Trek or Maverick etc...you can imagine my thrill to find your post when I googled her name with the play title...I remember almost falling into the orchestra pit in the dark until the stage manager caught me by the back of my costume...and Julie's graciousness...thanks for the memories! That's amazing! I'm so glad you found this post. It truly is a small world. Thank you for leaving your comment, I enjoyed it so much! It's an especially small world as, believe it or not, I'll be seeing Julie Adams this evening, 4-27-12, at a screening of SLAUGHTER ON TENTH AVENUE at the Egyptian Theatre. I just updated the post you found with a link to seeing Julie at a screening of CREATURE FROM THE BLACK LAGOON last fall. Wow...mind - blown. It truly is a small world, I would join you tonight but it is apparently sold out. Am truly overjoyed to know Julie is still active and look forward to reading her memoir - enjoy the show and please pass on a fond hello from one of "her girls" should you get the chance to speak with her! AnnieBee, I know that the Egyptian has occasionally had trouble with the online ticket sales site giving "sold out" messages when it actually isn't. You might want to try phoning them to verify -- I believe the office # is 323-461-2020 -- or Tweet a query to @SidGrauman.